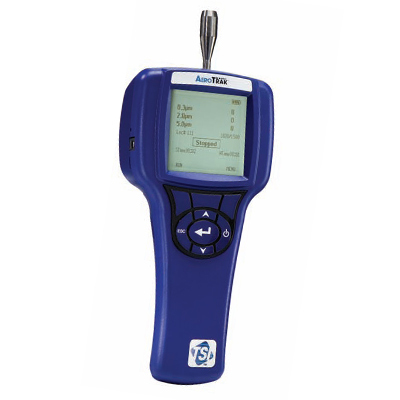 The TSI AeroTrak Handheld Particle Counter Model 9306 offers the most features and flexibility for customers interested in versatile handheld particle contamination monitoring. The Model 9306 features an ergonomic handle with thumb controls, for easy one-hand operation. The 3.6-inch (9.1-cm) color touch screen interface makes it easy to configure and operate. The Model 9306 can generate Pass/Fail reports for ISO 14644-1, EU GMP Annex 1, and FS209E. Particle count data can be conveniently viewed on screen, downloaded using TrakPro™ Lite Secure Software, or printed directly to an optional external printer. Multiple AeroTrak 9306 particle counter configurations can be conveniently stored and uploaded as needed using the TrakPro Lite Secure data download and reporting software supplied as standard. The Model 9306 complies with all the stringent requirements set forth in ISO 21501-4. These particle counters are calibrated with NIST traceable PSL spheres using TSI’s world-class Classifier and Condensation Particle Counters, the recognized standard for particle measurements.